Parasailing is one of the safest ways to experience the euphoric sensation of flying and surprisingly it’s also one of the most relaxing too. 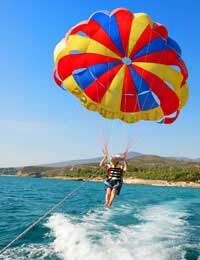 Parasailing, or parascending, is a watersport where a person sails through the sky whilst attached to a parachute and towed by a boat. One to three riders can simultaneously experience the buzz of rising up to 1,000 feet into the air. Paragliding is perfectly safe provided those involved complete the necessary training, make sure their equipment is safe and act in a responsible manner. The parachute canopy has a typical lifespan of around five years but, in the unlikely event of its premature failing, most pilots carry a reserve parachute. Paragliding may provide heady airborne thrills but it is a relatively relaxed and peaceful pursuit, with no sudden or abrupt movements. The passenger drifts into the air on launch and then once airborne is usually lulled into feelings of calm, and rarely are affected by any sensations of falling. Anyone can fly – the young, the old, the physically challenged - the only restrictions relate to weight. There are often minimum and maximum weight restrictions depending on the strength of the wind, the size of the parachute and weight of the participants. The stronger the wind the greater the weight needed in the parasail, although conversely some groups impose an upper weight limit of around 16 stones. Participants do not even need to be able to swim as take offs and landings usually take place from a platform on the back of the boat, although many people enjoy cooling off in the water and wear swimming gear accordingly. Both swimmers and non-swimmers are nevertheless required to wear lifejackets in the rare event of an operation malfunction or sudden weather change when they might end up in the water. All participants should also wear a helmet and some sunscreen, as passengers are completely exposed to the sun when up in the air. It is also sensible not to have drunk alcohol or eaten a heavy meal before take off as this might encourage feelings of motion sickness. Nevertheless, the parasailing ride is actually usually much smoother than that in the boat itself. Although parasailing does not require any special piloting skills to take part, in the interests of safe flying and the prevention of risks to others, participants are required to receive training before taking to the air. There are specific regulations relating to local national aviation law that need to be observed. Such rules concern the equipment the boat pilot needs to carry, the procedure of launching and flying the parasailors and the location of the flight.The most important advice for any parasailing newbie is to just relax. Before anyone is attached to the parachute, the chute is connected to the winch and then inflated. All the while it is carefully inspected for any signs of damage. Participants are first fitted with a strong harness and then, using its two stainless steel clips, connected to the parachute. The harness is sturdy enough to sit in, therefore making the ride all the more relaxing and enjoyable. Once sitting comfortably and mentally prepared for the experience ahead, the parasailor slowly rises up into the air as the winch rope is gradually released and the boat is eased forward. The line is designed to withstand 10,000 pounds of pressure and so with a typical pull only creating around 800, there is no danger of the line breaking and the parasailor floating off into space. Whilst in the air the participant has little or no control over their parachute and can just sit back and enjoy the flight. The industry standard flight time is around 10 to 15 minutes. When the joyous experience comes to an end, the parasailor is slowly and carefully winched back onto the boat’s platform. I'm afraid we can't recommend sites directly, but if you do an online search it should throw up some companies.